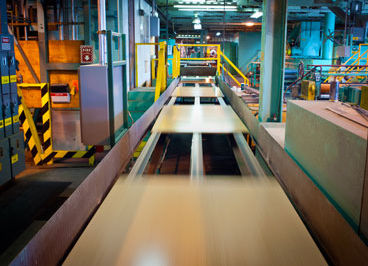 A. Veneer: Well-suited for cabinet and casework, veneer cores are manufactured by alternating the grain direction of each layer by 90 degrees. This cross layering creates exceptionally strong, lightweight and dimensionally stable hardwood plywood with excellent screw holding characteristics. B. 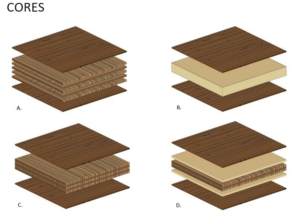 Composite: Using a particleboard (PB) or medium density fiberboard (MDF) core makes for a smooth, stable and flat plywood panel. This core type is perfect for projects requiring routing and shaping operations. C. Calibrated: This is the choice for high-end cabinet and furniture manufacturing requiring exact tolerances. Calibrated cores feature a precision inner ply with an exacting thickness consistency across the sheet. D. FiberPly: FiberPly features excellent machinability and superior screw holding combined with exceptional panel strength and durability. It features inner veneer layers and MDF layers under the hardwood face and back veneers. This core offers the strength and stability of a veneer core but offers a void-free surface for the face and back veneer producing a rigid, smooth panel.